On the Diamond Circle (quite). A few aerial photos on lake Myvatn and then east again! Grjotagja is a cave with hot water that used to be a kind of public pool. Here it is now forbidden to enter water. At this time we did not know about Myvatn Nature Baths (which we visited in january 2019), but if you are looking for a relaxing experience in hot water… that’s the place to go. East of the cave, along route 1, we reached Hverir, where a strong smell of sulfur (like rotten eggs) sorrounds a colorful landscape. 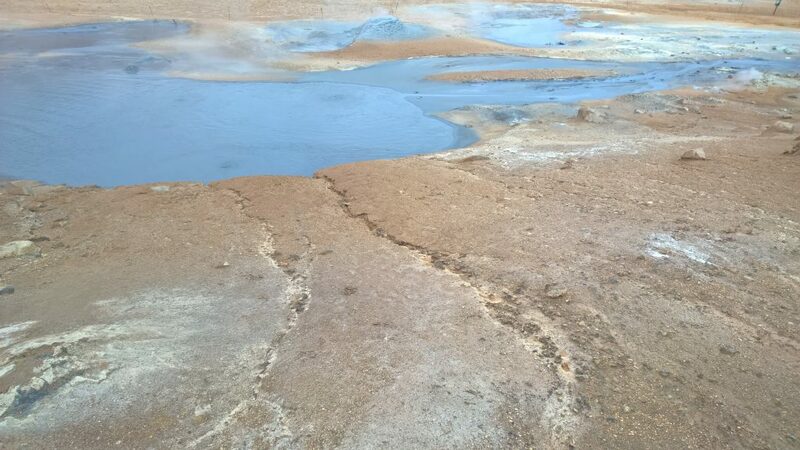 Here hot water creates puddles that boils and rocks that releases vapor. Krafla is near Hverir. It changed a lot since 2002 and 2004. The parking lot is bigger and there was so many cars that finding a place was difficult. We then took road number 1 toward east again. Dettifoss has a parking lot along road 862. This waterfall has the biggest volume of water of the entire europe (500mc per second). Altought we saw works for a new road, north of Dettifoss the path at that time was still uneven. The landscape was magnificent and led us to Hljodaklettar. Here basaltic rocks form spectacular hills. Asbyrgi is a canyon near the coast which is worth seeing. It has the shape of a horseshoe (there is a mythological story about the shape) with a small forest inside. At the top of the canyon there is a small waterfall that creates a small, peaceful lake. Time to go back, and in order to get other pictures of Dettifoss, we took road 864. From this side, Dettifoss canyon is magical.